How many people does a 9" cake serve? It seems like a simple question, but it can get very complex. There seem to be two commonly used charts: Wilton's and Earlene's. Wilton says that a two layer 9" cake serves 32. Earlene's Cakes says a 9" cake serves 22. Straightforward, if contradictory. However, both of these amounts are using the industry standard serving size of 1" × 2". That is a piece of cake the size of the business end of a fork. Everyone agrees that this is very small, but everyone also agrees that this is the standard. A standard is important because many cakes are priced by the serving. For those of use who want to eat cake, there is something called the Party Serving. We're getting a little better here. But how do I cut my son's birthday cake? And what if I would rather cut wedges than concentric circles? What about home bakers and amateur party party planners, for whom the industry standard isn't relevant, but appetites are? Well, I did some research, did a lot of math, and cut some cakes. I drew from Lark Cake Serving Guide, which I found to be the most clear. 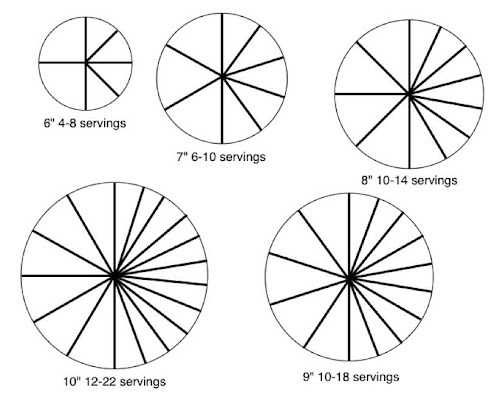 According to Lark Bakery, 10" is the largest round cake that can be cut into wedges. That's the largest size on my cake serving chart. I used two differently sized slices: generous and sensible. My sensible portion is about the size of a cupcake, and my generous portion is, well, generous. As Wilton does, I assumed that the cake is two layers deep. 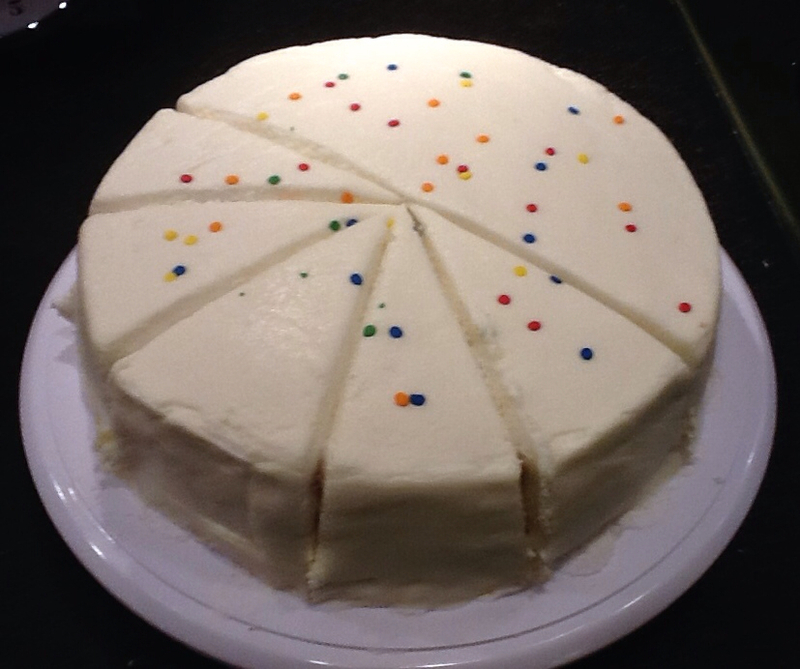 The cake above is cut into generous portions. Specifically, a generous portion is approximately 6.5 square inches, with a piece 2 by 3½-inches. A sensible portion is 3.5 square inches, with a piece 1¾ by 2-inches. 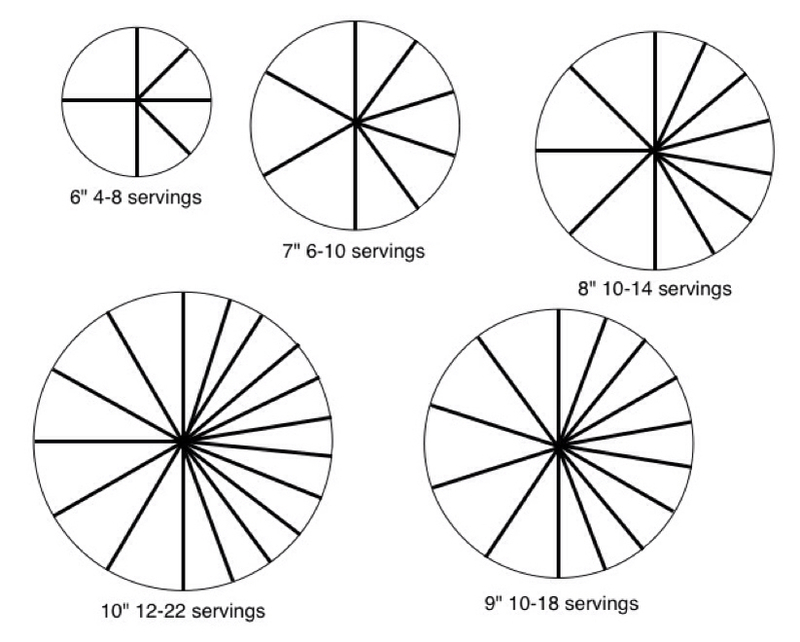 For smaller square and rectangular cakes, it is convenient to think of how to divide a cake along its edge—in thirds, fourths, or sixths. I have listed how to cut the slices on each edge for all sizes but 13 by 18-inch, which is in my experience too large to cut that way. salient points. I always feel like if I cut them the easy way I end up with Huge servings. Which is fine by me...but often too much for children. Still... your graphs only prove the point that you're a nerd. A loveable one, but a nerd nonetheless. Nerds rock! Long Live the Nerds! this is so nerdy; i love it! do you know how many times i've pondered the cake-cutting issue? Many times, let me tell you. book. marked. I gravitate towards the 'sensible' sizes - i feel like you can always get more if you need it. :) love those utensils, by the way, and what a cute cake! the smattering of palettes is adorable. 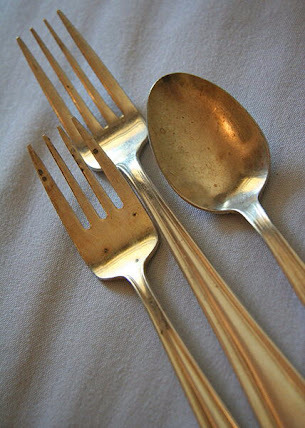 The forks etc are Creative Commons images from Wikipedia. Most people seem to love the sensible sizes. Sometimes it's hard for me to cut that narrow though. I should probably mark the slices before I cut. I use the "cake slicer" app from http://cakeslicer.bakingit.com. This gives you options of portion sizes. That looks like a great app. It seems, by content and price, to be directed at professionals. 16 slices from a 8 or 9 inch layer cake. Period. It's easy to score and cut. No one needs more than a small slice of cake in this super size me country. Melanie Shelton is The Cake Flake! I've been baking for 15 years, but only recently focused on cakes. I like my cakes moist and sweet, and I prefer to bake from scratch. I started this blog to become a better baker and decorator, and to share my experiences and original recipes. You can contact me at TheCakeFlake@gmail.com.